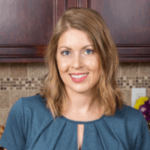 Published: Nov 19, 2018 · Modified: Apr 11, 2019 · By Jen Sobjack · This post may contain affiliate links. This classic peanut brittle recipe is easy to make, full of buttery peanut flavor, and is great for packaging up as holiday gifts. One of the best things about the holidays is biting into a crunchy, butter shard of peanut brittle. It’s such a classic treat around this time of year. One that my family has enjoyed for decades. I love making edible gifts for the holidays! Chocolate espresso spoons are often my go-to choice along with chocolate truffles and peanut brittle. There are, in fact. many variations of brittle all around the world! 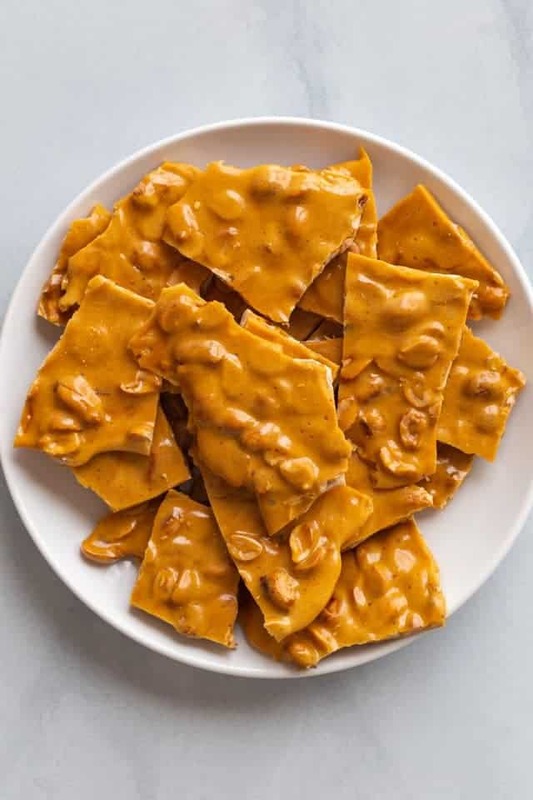 This old-fashioned recipe for brittle comes from the United States and uses very basic ingredients like sugar, corn syrup, salt, peanuts, butter, baking soda, and vanilla. There’s a good amount of corn syrup in this recipe to prevent the sugar from crystallizing so the brittle isn’t grainy. The end result is shiny shards of sugary brittle that dissolve on your tongue with crunchy peanuts that are toasty and flavorful. Is so good and anyone would be happy to receive this edible gift for Christmas! 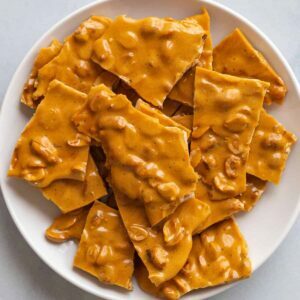 How to make peanut brittle? You will be so surprised at how easy homemade peanut brittle is to make! 1) Start by having all the ingredients measured out beforehand. You need to work fast when making brittle and won’t have time to measure as you go. 2) Grease a large baking sheet with nonstick spray or line it with a silicone mat. 3) Cook the water, sugar, corn syrup, and salt in a heavy bottom pot over medium heat until it begins to boil. 4) Insert a candy thermometer and boil without stirring until the mixture reaches the soft ball stage, 238°F. 6) Remove the pot from the heat as soon as it reaches 300°F. Immediately stir in the butter, baking soda, and vanilla. The mixture will bubble rapidly and steam up so take care when mixing. 7) Quickly pour the mixture onto the prepared baking sheet and spread it into a thin layer using the back of a wooden spoon. It takes about 10-15 for the brittle to cool completely. Once it has cooled, you can gently shimmy a spatula underneath it to loosen it from the pan and break it into pieces. 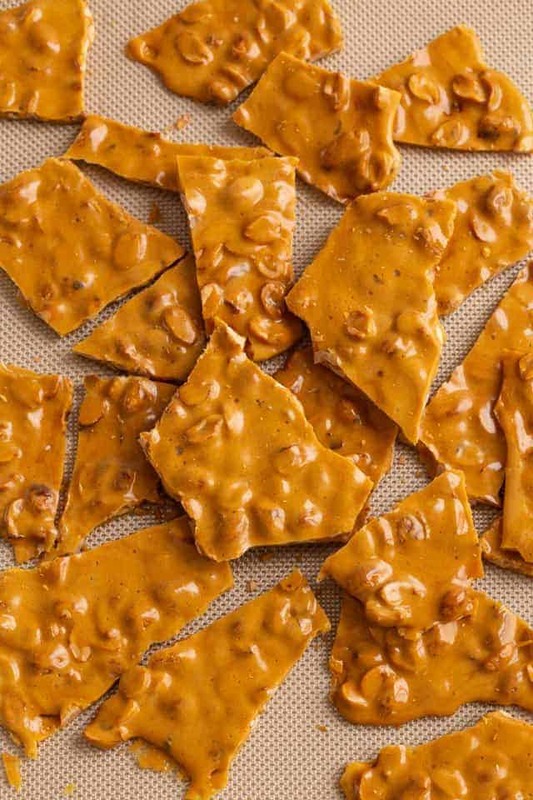 Can you pour peanut brittle on parchment paper? If you want to line your baking sheet with parchment paper, that will work also. But I suggest lightly misting the paper with nonstick spray just as an extra precaution to prevent the paper from sticking to the bottom of the brittle. Peanut brittle will keep for well up to 2 months if it is stored correctly. How to store peanut brittle? Place the peanut brittle in zip-top bags, jar or containers with tight-fitting lids and store in a dark and dry location that stays fairly cool. The brittle must remain completely dry so refrain from putting in a humid environment like next to the stove or in direct sunlight. It’s also best not to store it in the refrigerator. This peanut brittle is perfect for packing up as Christmas gifts. Other fun gifts to pair with brittle are candied orange slices, chocolate fudge rum balls, and Mexican hot chocolate fudge bites. Have all the ingredients measured and set out before you begin! Grease a large baking sheet with butter or nonstick spray. Set aside. In a medium-sized heavy bottom pot, stir together the water, sugar, corn syrup, and salt. Cook over medium heat until the mixture comes to a boil. Boil without stirring for about 5 minutes until it reaches 238°F on a candy thermometer. Add the peanuts and cook for 2 to 3 more minutes, stirring constantly, until it reaches 300°F on a candy thermometer. The mixture will be golden brown. Remove from heat and immediately stir in the butter, baking soda, and vanilla. Immediately pour the mixture onto the prepared baking sheet. Spread it with the back of a wooden spoon until it’s the desired thickness and even. Let cool 10 minutes or until hardened. Break into pieces, using a large spoon. Store in an airtight container or plastic freezer bag. The brittle will keep for up to 2 months stored in a dark, dry place that stays fairly cool. Refrain from storing the brittle in the refrigerator, next to the stove, or in direct sunlight. This will degrade the quality and shorten the shelf life. **Use a heatproof silicone spatula or wooden spoon. If you are unsure if your silicone spatula is heatproof, use a wooden spoon instead. Avoid using plastic or nylon utensils for stirring the brittle because they will melt. Thanks for the peanut brittle recipe. I ate my first peanut brittle 2 months ago. Honestly, it is a rich peanut goodness anyone who loves peanuts like me, can’t resist. Lol. It is my newly found favorite. 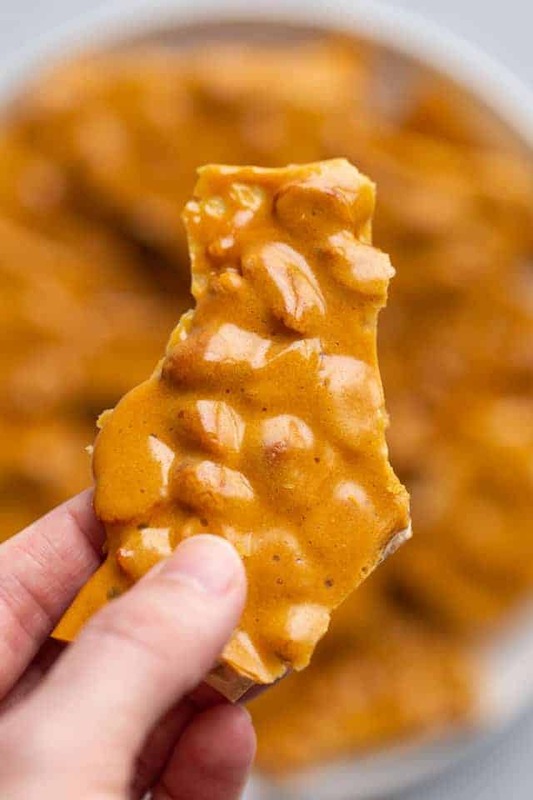 We are peanut brittle fanatics and love this recipe too! This was very simple and super delicious! When you say quickly pour into prepared pan you were right, it hardens up very fast, lol. I had been craviing peanut brittle and could not find it in my local grocery store. Not wanting to go to See’s, I decided to give this a try. Gonna make this agian when I have another craving 😁! Thank you Jen! Yay! 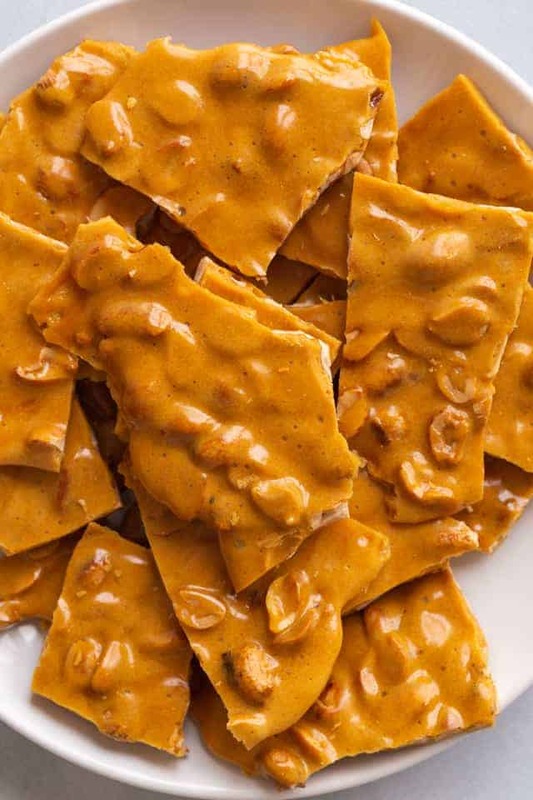 This is one of my favorite peanut brittle recipes! Yikes! I’m sorry that happened. I use my silicone spatula all the time and never had an issue. Maybe it’s the quality of the spatula, but I’ll make a note on the recipe. Peanut brittle was always one of my favorite candies!